The 75th anniversary of the publication of the book! The book was first launched 25th June 1943 under the Librairie Gallimard label and dedicated to ‘Castor’ this being Sartre’s name for his beloved Simone de Beauvoir, the noted feminist. This isn’t a post that claims to be an accurate description of existentialism, or an expert’s analysis of Sartre’s philosophies as I am writing from the top of my head and then referring to particular works I read a long time back, as well as a bit of recent research to fill in a few gaps. My knowledge of existentialism is quite rusty as I’ve not read any of the major works for quite a few years however did I cover these subjects in depth for both college and university. Sartre was captured by the Germans in June 1941. A prisoner of war, he was fortunately able to read a book of his own choosing – Heidegger’s Being and Time. One can see why Sartre’s captors allowed him to read the very book in question. Upon release in early 1942 Sartre took up his old career as a teacher and in his spare time set about reading and analysing further Heidegger’s work as well as Merleau-Ponty’s Phenomenology of Perception. From this Sartre decided to set about putting his own theories on the subject of existence into practice. Being and Nothingness was published in June 1943 although it would be another ten years or so before an English translation was made available by courtesy of Hazel Barnes, whose tireless work dealt with a number of Sartre’s books. Sartre was a prolific writer. As he progressed he became a strong socialist, drifting away from existentialism towards a Marxist stance. He was often found leading demonstrations against the establishment, especially the 1968 student riots, in fact he was the very inspiration why the students took to civil unrest in the first place. Each of the existentialist masters during the 1920s to 1940s had their own dedicated interpretations of what it meant to be in existence but invariably run into philosophical conundrums problems which take a lot of time to explain, but never quite fully satisfactorily. Many of the early existentialist books from those years were essentially tomes, hundreds of pages long, Sartre included. My 1966 copy of Being and Nothingness amounts to nearly 700 pages, excluding the lengthy introduction by Hazel Barnes. 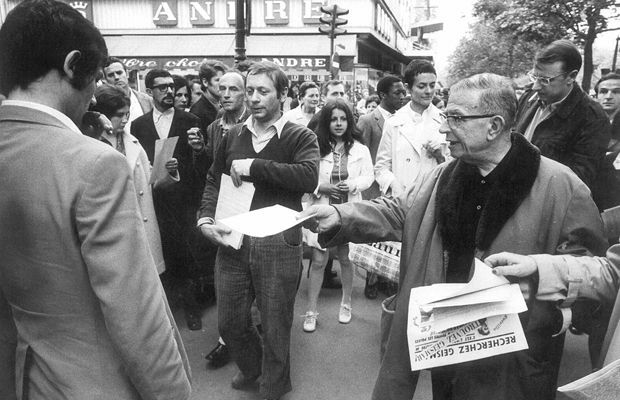 Perhaps the most notable, most well known aspect of Sartre’s book is Bad Faith. Though the concept has been around a long time, Sartre took it to new levels. Let us take the opportunity to look at a few other existentialist books in my collection…. Search for a Method. One of the many works I have. This was a Vintage Books edition published in 1968. Using Sartre. Introduction to the early works on everything from Descartes to Bad Faith. Published 1994. Critical Existentialism – Nicola Abbagnano. A comprehensive look at the philosophy’s various themes as seen through the eyes of Abbagnano, who was Professor of Philosophy at the University of Turin. He is one of the much lesser known existentialists however here’s his Wiki page. Published by Doubleday 1969. Husserl’s book, published by Harper 1965. Phenomenology and the Crisis of Philosophy. Whilst not exactly an existentialist book its one of several I have on Husserl whom existentialists found very influential. Here Husserl tries to set out a case for making philosophy a science. In fact he denounces other sciences to an extent including psychology (an assertion I have read time and time again by others especially as psychology relies on the subjective contrary to popular assertions.) Husserl makes out that the natural sciences are reificationist because they change consciousness into the absurd. He tries to modify other theories such as Bretano’s intentionality, Hegel’s phenomenology and especially Cartesian philosophy. His view is phenomenology alone can explain things properly and thus brings us to the old chestnut whether psychology is actually a science. Husserl says psychological experiments simply are a defective means of analysis because these experiments must by nature be experiments into themselves. Husserl was expert at pointing out the many problems of analysing existence and influenced most existentialists. Heidegger was one of Husserl’s best ever students and 20th century existentialism actually began because of Husserl. Heidegger’s Being and Time is dedicated to Husserl. Sadly Heidegger became a friend of the new German regime and ultimately Husserl wanted no more to do with his favourite student. I haven’t got any works by Heidegger himself, though I do have a couple of works that discuss Heidegger’s philosophy retrospectively. This, Being-in-the-World is a substantial volume that examines Heidegger’s notion of Daesin and other aspects of the philosophy set out in Being and Time, which is what Herbert Dreyfus has achieved. It has been the understanding of Sartre’s Being and Nothingness also depends upon a good background of Heidegger’s work. Published by MIT 1991. Six Existentialist Thinkers by H. J. Blackham (published RKP 1952) advocates the usual batch of existentialists recognised at that time (Kierkegaard, Jaspers, Marcel, Heidegger, Sartre) but also uniquely includes Nietzsche. He wasn’t an existentialist however in 1950 Walter Kaufmann’s book, Nietzsche: Philosopher, Psychologist and Antichrist, discussed Nietzsche’s notions in line with existentialism. Although Nietzsche is more of a nihilist, one can say existentialism is in fact about nihilism too. The central core for both sides is that existence has no real value. Our attempts to describe it are futile and thus there is no real meaning to life. Not surprising then the next book by the famous philosopher, Herbert Read, is titled Existentialism, Marxism and Anarchism. This little known work was published by the Freedom Press in 1950, hence we can see there was a strong phase during the early fifties where anarchy/nihilism/existentialism/marxism were were somewhat uneasy bedfellows. Marxists don’t generally approve of existentialism however the problem is Marx and Engels themselves too tried to explain the notions of existence so there is an important theme although the approach is different. If one has read Marxism and how Marx himself came to formulate his theories, it will be found he shared similar sources of inspiration to Kierkegaard. Both philosophers attended the series of lectures in Berlin by Schelling during 1841 and for all we know may have even met each other. The commonality for both is they attacked Hegel’s system of thought yet ended up with totally opposite directions of thought. Read himself claims ‘The Marxist is really more existentialist than the existentialists.’ Concepts of Marx’s such as alienation have overtures in existentialism though academics say its very hard to actually identify how the two philosophies could be strong bedfellows. The Freedom Press still exists today and its range of alternative books can be found at the store located behind the Whitechapel Art Gallery.